The therapeutic value of a spinal adjustment are many. It can reduce muscle tension, restore proper range of motion, reduce inflammation and swelling in the associated joints and muscles, as well as restore proper nervous system tone and function. 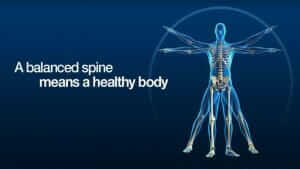 Your spine is made up of 24 movable bones called vertebrae. Each of these bones has a few surfaces that contact the vertebra above and below. You have an intervertebral disc between each vertebra as well as two little joints called “facet joints” on the rear part of the vertebra. These are the joints you may hear clicking and popping when you stretch your back or neck. And last but not least, you have a nerve that exits between each vertebra in a hole right behind the disc. So, with that in mind, what do adjustments do? The answer is, many things. Each vertebra has multiple sets of tiny muscles that connect it to each other and enable us to adjust our posture and bend our spine in the fashion that we desire. Sometimes due to injury, stress, poor posture, or an inactive lifestyle, these vertebra can become slightly misaligned and pull on these muscles which can cause soreness. The misalignment of the vertebrae and the subsequent stiffness due to tight muscles is called “subluxation.” Not always but often, the nerve that exits the spine above or below this subluxated area can be interfered with to varying degrees. This can send false signals down the nerve to wherever it is headed or inhibit signals sent from the brain to the nerves destination. In general this loss of communication between the brain and the body can cause numbness, tingling, pain, muscle fatigue, muscle cramps, and can even cause problems with your internal organs. Our chiropractors are highly trained to find and correct these misalignments, or subluxations, through a gentle force applied very specifically to the affected vertebra. This applied pressure if done quickly and usually painlessly. This “adjustment” is often, but not always, accompanied by a clicking or popping noise caused by the facet joints we talked about earlier. Chiropractic adjustments are most always a painless procedure, but if you are sore in a region where the muscles and joints are inflamed, applying pressure may cause some discomfort. Don’t worry though! Our chiropractors are sensitive to a patient’s tolerance for this pressure, and if the area is too sore, they will choose a different treatment for that visit.